Perth Festival always brings life and a wealth of theatre, dance, art and of course the Writer’s Festival to enliven our summer. With the program release for 2018 we can see that next year will be no exception. There is a wide variety on offer for the stage, with a varied range of works offering everything from circus, to puppetry, to more traditional forms of theatre. The Australian premiere of The Barber Shop Chronicles by Nigerian-born Inua Ellams, should provide music and laughs through 6 different barber shops located in London and Africa. Farewell to Paper is a one man show by poet Evgeny Grishkovets who poignantly and hilariously bids adieu to the material that has served humanity so ably for centuries. Two estranged brothers explore interplanetary mysteries in The Far Side of the Moon. The work by Robert Lepage will be performed by Yves Jacquer, and have a score written by Laurie Anderson. 2018’s Artist in Residence, the fifth generation master of Chinese glove puppetry, Yeung Fai will present Hand Stories. This is an autobiographical piece combining traditional Chinese puppet theatre with multi media effects. We will also see a number of Australian pieces. The Black Swan Theatre Company and DADAA bring us You Know We Belong Together, a celebration of love, living with Down Syndrome and Home and Away. Sydney’s Nat Randall will repeat the same scene (from John Cassevette’s Opening Night) a 100 different ways, with a 100 different co-stars (all volunteers), in The Second Woman. Each interaction will bring change, and fashion new meaning in the work. Dance also offers a wide variety of works to suit a wide range of audiences tastes. Taiwan’s U-Theatre will combine martial arts, taiko drums, music and multimedia for Beyond Time. This will be an Australian exclusive, created from a 50-day walking meditation across Taiwan. Whirling dervishes will take to the stage for White Spirit. 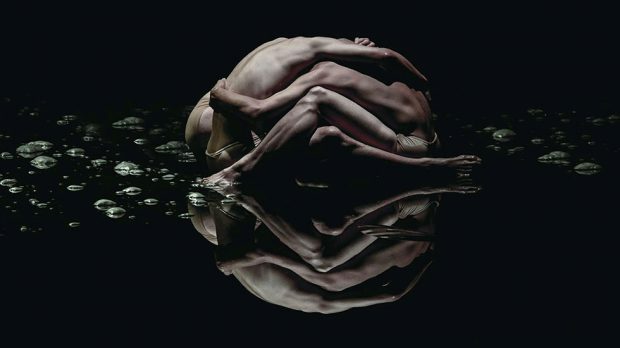 Dancers will be pushed to their limit on a flooded stage with the collaborative efforts of Belgium choreographer Damien Jalet, and Japanese sculptor Kohei Nawa in Vessel (pictured). The music of Erik Satie, Patti Smith, and David Bowie will provide the score for Michael Clark and company in to a simple, rock ‘n’ roll …song. Australian dance luminaries Lucy Guerin, Gideon Obarzanek, and Dancenorth team with Indonesian music duo Senyawa for a trance-dance odyssey that will invite audiences on stage to share in the ritual of ecstatic abandonment that is Attractor. The festival will also see the return of the West Australian Ballet’s popular Ballet at the Quarry. This year will see a collaboration with the Gary Long NT Dance Company, as well as opera singer Deborah Cheetham for Milky Way, a retelling of the Lang’s mother Yolngu Milky Way creation story. 2018 will see the usual host of excellent writers showcased in Writer’s Week, curated by William Yeoman. Guests will include the literary talents of Helen Garne, Kim Scott, Tim Winton, William Yang, Claire Coleman, Allan Hollinghurst, Jenny Zhang. The year will also see a strong visual component with the 2018 Visual Arts program. Be that the South Korean artist Kimsooja, New Zealand artist Lisa Reihanna’s 2017 Vienna Biennale hit Emissaries, Pilar Mata Dupont’s examination of legacies of colonisation in the Pilbara (Undesirable Bodies), or works by Zadok Ben-David, Christopher Charles, or Latai Taumopeau.